Safe – Non Radioactive Enzyme release assay. Versatile – Useful for measuring activity of T Cells, Primary Cells, NK, complement and other lytic agents. Assay can be run in serum supplemented media. Homogenous – One-step, no wash assay. Assay can be run in same plate as samples. FAST – Results in 3-5 minutes. Chromium 51 or europium release for measurement are time consuming. The inherent sensitivity of luciferase detection is enhanced by the amplification effect of enzyme turnover, which produces thousands, millions or billions of high – energy molecules for each molecule of the enzyme. Highly Sensitive – Can detect fewer than 500 cells/well in the presence of serum or as few as 10 cells/well in serum-free or heat-killed media. GAPDH: The fact that GAPDH is a natural component of cells, and does not need to be introduced into the cells in any manner, distinguishes this assay from all methods which require prelabelling of cells, transfection, transformation, or other methods of introducing proteins or other molecules into the target cells in order to generate a signal in a later step. Advantages for measurement of cell mediated or complement mediated cytolysis – It is usually desirable to use smaller numbers of TCells than are needed for the 51Cr – release assay, since excessive numbers of effector cells can increase the background signal. This is now possible due to the high sensitivity of aCella-Tox. Non-destructive assay allows monitoring of additional parameters. GAPDH is an important enzyme in the glycolysis and gluconeogenesis pathways. This homotetrameric enzyme catalyzes the oxidative phosphorylation of D-glyceraldehyde-3-phosphate to 1,3-diphosphoglycerate in the presence of cofactor and inorganic phosphate. In the aCella-TOX reaction scheme the release of GAPDH is coupled to the activity of the enzyme 3-Phosphoglyceric Phosphokinase (PGK) to produce ATP. ATP is detected via the luciferase, luciferin Bioluminescence methodology. Further, aCella-TOX is a homogeneous cytotoxicity assay; alternatively in dual mode, aCella-TOX can measure cytotoxicity and cell viability in the same plate. Culture supernatants can also be removed from the original plate and assayed in a different plate, allowing kinetics runs to be set up. The assay is non-destructive, allowing the monitoring of additional parameters such as gene expression. The aCella-TOX method has been tested with many modes of cytolysis, including; cellular cytotoxicity (T cells) complement (2,3), pore-forming agents, antibiotic-mediated lysis of bacteria, and detergent mediated and mechanical lysis The method is highly general, since all known cells express copious amounts of GAPDH, and, unlike other enzymes, GAPDH is very readily released from the cytoplasm upon cell lysis. 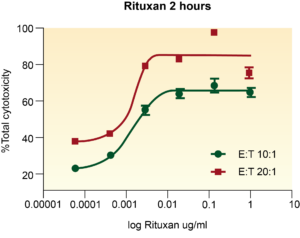 Using specially adapted formulations, the sensitivity of the method can be driven below 1 eukaryotic cell (2), which is impossible with any other reported liquid-phase method. Please consult with us if you have an application requiring specialized techniques. Unlike virtually all standard assays, including 51Cr release and the Eu3+ assays, aCella-TOX does not require labeling of the target cells. No separations are needed. After completion of the lytic process under study, the aCella-TOX reagent is formulated and added to the wells, and luminance is read after 3-5 minutes. Due to the extreme sensitivity of aCella-TOX, especially if serum-free or heat-killed media are used, it is frequently possible to shorten the incubation time for the lytic process. It is usually possible and desirable to use smaller numbers of T cells than are needed for the 51Cr-release assay, due to the high sensitivity of aCella-TOX and the fact that excessive numbers of effector cells can increase the background signal. 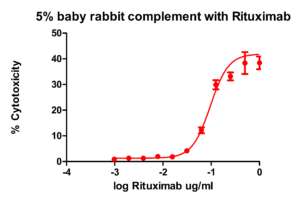 Figure 1: 5000 Ramos cells/well were incubated with serially diluted Rituxan antibody for 15 minutes prior to the addition of purified NK cells stimulated overnight with IL-2. The ADCC reaction was further incubated for 2 hours at the specified E:T ratios. % Cytotoxicity was measured using the aCellaTOX assay. 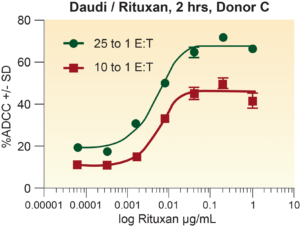 Figure 2: 5000 Ramos cells/well were incubated with serially diluted Rituxan antibody for 15 minutes prior to the addition of purified NK cells stimulated overnight with IL-2 . The ADCC reaction was further incubated for 3.5 hours at the specified E:T ratios. % Cytotoxicity was measured using the aCellaTOX assay. 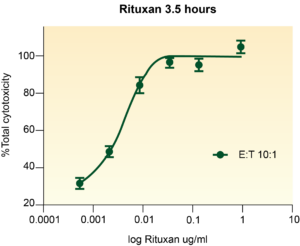 3.5hour timepoint has been optimized with the 10:1 E:T ratio. Figure 5: A Direct comparison of 51Cr and aCella-TOX was carried out with the same donors with Daudi Cells. Log (EC50) value for aCella-TOX was -2.23, and that for 51Cr was -2.087 for Donor A. Figure 6: A Direct comparison of 51Cr and aCella-TOX was carried out with the same donors with Daudi Cells. Log(EC50) value for aCella-TOX was -2.612, and that for51Cr was -2.77 for Donor B. Methods and compositions for coupled luminescent assays. United States Patent 6,811,990 Corey and Kinders, issued November 2, 2004. Corey, M.J., et al., "A Very Sensitive Coupled Luminescent Assay for Cytoxicity and Complement-Mediated Lysis," Journal of Immunological Methods 207:43-51, 1997. Corey, M. J., et al., Mechanistic Studies of the Effects of Anti-factor H Antibodies on Complement-mediated Lysis,” Journal of Biological Chemistry 275: 12917-12925, 2000. Schafer, H., et al., "A Highly Sensitive Cytotoxicity Assay Based on the Release of Reporter Enzymes, From Stably Transfected Cell Lines," Journal of Immunological Methods 204:89-98, 1997. Decker, T. and Lohmann-Matthes, M.L. (1988) A quick and simple method for the quantitation of lactate dehydrogenase release in measurements of cellular cytotoxicity and tumor necrosis factor (TNF) activity. J. Immunol. Meth. 115, 61-9. Korzeniewski, C. and Callewaert, D.M. (1983) An enzyme-release assay for natural cytotoxicity. J. Immunol. Meth.64, 313-20. Crouch, S.P.M., et al., "The Use of ATP Bioluminescence as a Measure of Cell Proliferation and Cytotoxicity," Journal of Immunological Methods 160:81-88, 1993.